Newer: » Ambergris Caye Reef Week has started! Phillip and April Vannini are two researchers from the Royal Roads University in Victoria, British Columbia Canada, who along with their young daughter Autumn are on a five -year journey to visit 24 UNESCO World Heritage Sites. Of course, Belize was part of their quest. They explored many sites around the country, including Laughing Bird Caye and Glovers Reef in Southern Belize, The Blue Hole and Half Moon Caye Natural Monument and the marine reserves around Ambergris Caye. Belize is the seventh stop within their research project ‘In the Name of Wild,’ which is funded by the Federal Government of Canada through a grant program. The project focuses on understanding how wilderness can mean many different things to different people living among these heritage sites. They plan to visit 24 World Heritage Sites; ten in Canada, and the remaining 14 around the world. Belize is their fifth international stop on their itinerary outside of Canada. April told The San Pedro Sun that the idea to embark on this exciting and educational project came after a visit to the Galapagos Islands, off the coast of Ecuador, two years ago. “Many people, when they hear about the Galapagos, all they think about is the animals that inhabit those islands,” said April. “We were surprise to find out that a lot of people live there, and not many people know about it. So we decided to explore, by looking at people who live in these areas and how sites interact with their natural heritage.” According to the April, there are about 30,000 people living in the Galapagos Islands. Phillip emphasized the importance of documenting the stories and experiences of the people at these monumental areas and how their relationship with Mother Nature is. “People might think that by naming these places natural or wild, we are ignoring the people and cultures that makes them so special,” said Phillip. They chose Belize for its Barrier Reef, a UNESCO World Heritage Site which is under threat. As well, they wanted to learn from a variety of people involved in protecting such a monumental natural resource. When they arrived in Belize, they visited the Placencia Peninsula on March 21st, where they interacted with the locals, learning about fishing, conservation and tourism. They had the opportunity to visit their first Belizean World Heritage Site at Laughing Bird Caye, along with personnel from the Southern Environmental Association that manages the site. While there they learned about the coral restoration around the island. The project, spearheaded by a community based organization called Fragments of Hope Belize, advocates for sustainable management of the reef. The Vanninis also had the opportunity to kayak around the Placencia area and learned first- hand, the importance of mangroves to the reef ecosystem. A few days later they visited the research station at Glover’s Reef where they spent a week. “It was an unforgettable experience to visit Glover’s Reef,” said April. “We spoke to folks from the Belize Fisheries Department who look after the marine protected areas around the area and check on fishermen who fish nearby.” They described Glover’s as a haven for pelicans, iguanas, giant lobsters, turtles, rays and reef sharks. “You look at these areas and you are told that they are pristine, untouched nature, but what is also important is the people that live and work there, which is a vital component that makes these places what they are,” said Phillip. They believe that there is no division between cultures and nature and that people are part of the natural resources. They also explored the wild underwater world of Belize’s Great Blue Hole. “Belize is amazing,” said the Vanninis. Back onshore on Half Moon Caye the researchers spent time with personnel from the Belize Audubon Society, the non-governmental organization that manages the site. They were impressed with the management and research efforts to keep those places part of the heritage for future generations. They also highlighted the environmental education programs that teach the value of the magnificent underwater life, and community outreach. 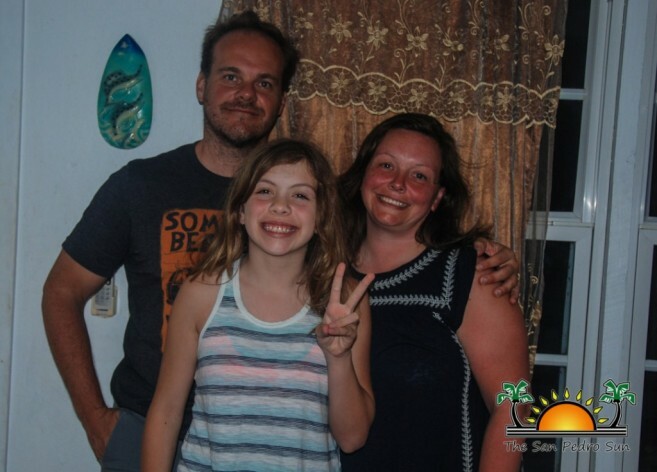 While they were on Ambergris Caye, the Vanninis spent time with many San Pedranos who, like the many Belizeans across the country, they deemed as wonderful people. They also spent time with the folks from Projects Abroad and community grassroots activists. After exploring Bacalar Chico National Park and Marine Reserve, they had the opportunity meet with personnel from Oceana in Belize and learn about the community campaigns to stop such activities such as offshore drilling explorations around Belize’s World Heritage Sites. According to April, they have learned a lot about the economic contribution the natural resources brings to the country. “It is very important to know how much income comes to this country via tourism itself, based on the Barrier Reef,” said April. “We applaud Belizeans for their passion to protect it from any threats that will further endanger it.” They believe that if offshore oil exploration is considered in Belize, it will not only jeopardize the World Heritage Sites and livelihood of the thousands that depend on it, but it will create uproar from the international community. “People come here to enjoy and appreciate these sites, they have a universal value, not just for Belizeans, but people around the world, and that’s why they have been designated as World Heritage Sites,” said April. The Vanninis left Belize on Wednesday, April 5th en route to their next stop in Japan. They hope that by the time their project is completed in 2021 the Belize Barrier Reef will still be a wild place where humans, flora, and fauna can co-exist peacefully for generations to come.